Adrian Franks' Portrait of Michael Brown. Credit Image Courtesy of the Artist. Artist Adrian Franks is no stranger to producing work based on tragedy. 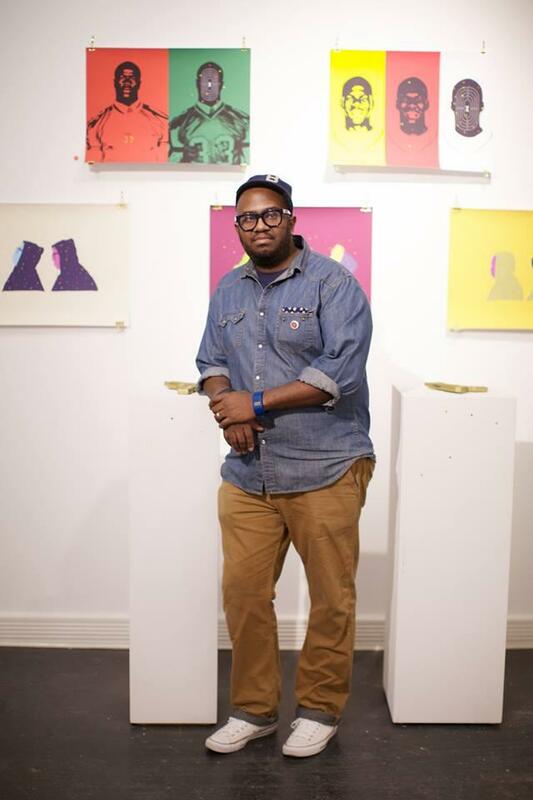 He’s produced a series of images based on the deaths of black men at the hands of law enforcement -- a series that includes Eric Garner, Sean Bell and now Michael Brown. 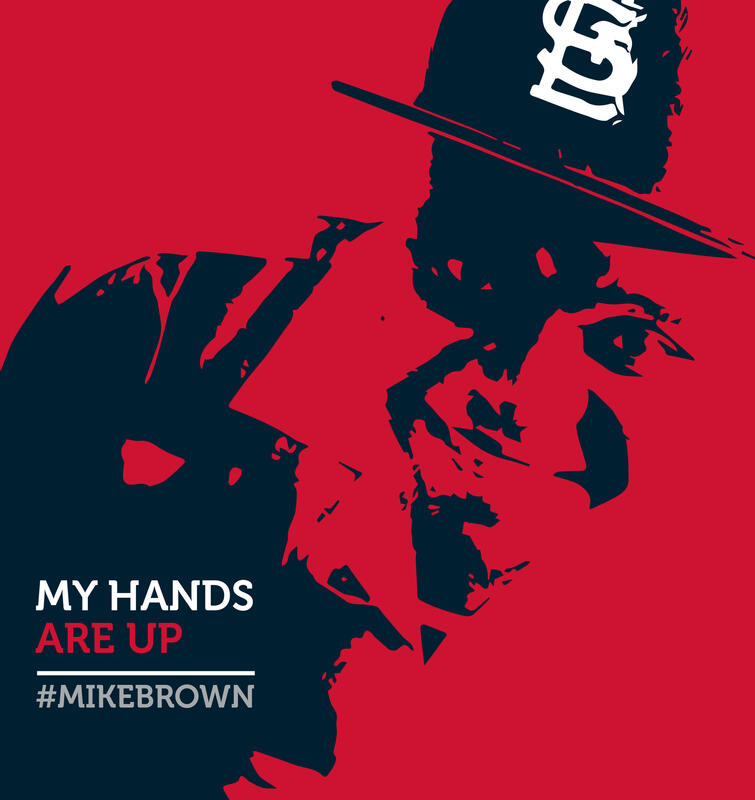 Franks’ black and red image of Michael Brown with the lettering “My Hands Are Up” is gaining traction on social media. He recently spoke with reporter Willis Arnold about the image and his reaction to the news of Brown’s death. The interview has been edited for length and clarity. St. Louis Public Radio: When did you first put the image up online? Franks: I think I put the image up online the day he was actually shot and murdered. I was scrolling through Instagram, different streams, and I just started seeing different hash-tags and postings coming from St. Louis pertaining to the young man who was just shot and killed by the police. I was like, what is going on? I felt like I got to do something. I got to put something out there to get people thinking about these serious issues of black males in particular meeting a lot of violence. To me, I’m just being who I am. I see an issue and I talk about it and add it to my work. What part of the story specific to Mike Brown inspired you to create the image? Franks: Well, Mike Brown is a young man. I’m going to assume that he's about to start college. He reminds me of my nephews. So to see guys like him, guys I see every day on my block here in Bed-Stuy Brooklyn, and one day they’re here and the next day they’re gone because of the negligence of somebody who’s perceiving him to be a threat - if that don’t move people, than I don’t know what will. Mike Brown could be any one of us. I could get done in the same manner and I’m a 37-year-old vet, a professional creative person. You know that’s what resonates with me. His story could be any one of our stories. What do you hope the image does for people? Franks: I hope that the image more than anything will remind people that you know these individuals are human beings. They once were living human beings, but they're human beings nonetheless. And they have a story that never really should be forgotten. These images that I’ve been putting out, they remind me of when I was a kid in Atlanta. Shortly after, I would say '84, the Atlanta Missing Child Murders, a lot of the community would put up these kids who were missing with the murals. I remember seeing that as a kid, a constant reminder that these kids were once part of the community and that we should never forget about them. Those images on these big walls on these murals, they inspired me to create the images I make today. What similarities do you see between the incidents that you’ve chosen to represent visually? Franks: If you want to talk about the four images that I’ve produced over the last couple years -- Eric Garner and Mike Brown and Jonathan Ferrell and Sean Bell. All four of those men were all unarmed, No. 1. All four of those men were shot multiple times or done some type of injustice by the police. In the case of Eric Garner, he wasn’t shot, he was choked to death. What visual influences did you draw on to create this piece? Franks: I mean he’s a very innocent kid. He’s got on a baseball cap, a button-down collared shirt. And that was that. But obviously he’s from St. Louis. St. Louis has that attitude, baseball teams, like the Cardinals. So I decided to go with red. Red is indicative of the colors of the teams, the red and blue, but also red is the blood. This guy was shot in the middle of the street. The images I saw were of a young man in the middle of the street bleeding out on the concrete. So red is that image. It’s his blood, ultimately. St. Louis artists have responded to the shooting death of Ferguson teen Michael Brown — and the ensuing protests — with both frustration and compassion. Some reacted as fathers and former Ferguson residents while others actively joined into the weekend's protests. Rapper Tef Poe, was in Ferguson Sunday and said he expects the events of the weekend to reverberate throughout the St. Louis hip hop community.